Despite the popularity and acceptance of street art as a legitimate form of art, there are still large tracts of society that see vandalism where another person might see a Banksy. While city councils commission large scale murals by urban artists to gentrify neighbourhoods, Jo Public pens petitions to have pieces removed or stopped in their tracks altogether. Even those that enjoy street art are taking issue with its ability to hipify and price them out of the areas they live in. The argument against street art is not as flat as the walls that it’s painted on and the frontline is all at sea – eight miles off the coast of England to be exact. 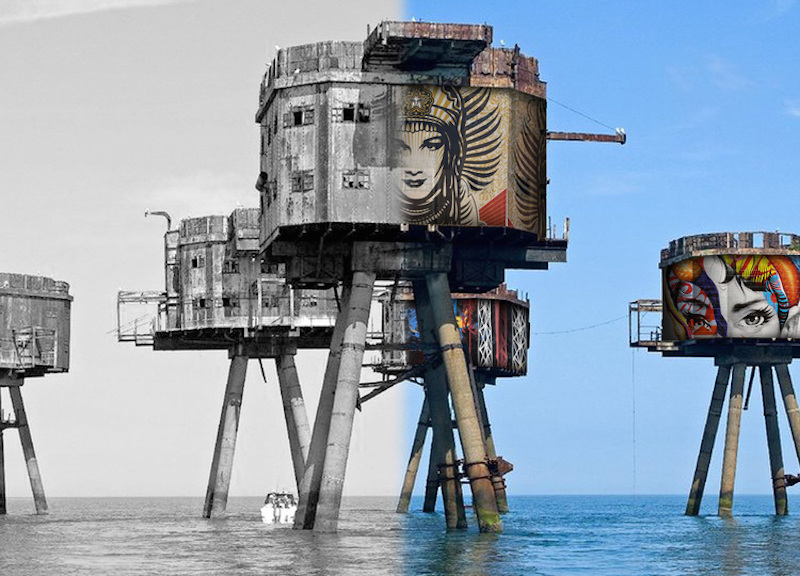 The Painted Oceans project has been an audacious plan, spearheaded by artist Tristan Eaton and developed carefully over four years, to restore the seven towers that comprise the Red Sands Sea Forts that stand proud yet deteriorating in the Thames estuary, as beacons of British military history. 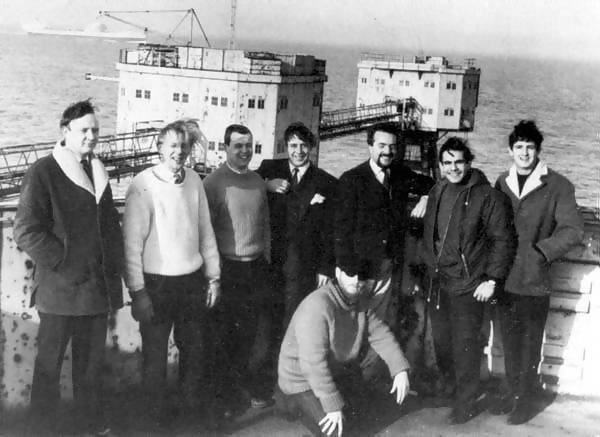 These seemingly floating fortresses were built during World War II to defend the United Kingdom and after each tower was decommissioned, they were occupied by various pirate radio stations transmitting censored and salacious music that bypassed BBC standards. So as well as serving a legitimate piece of history, they’ve long had a history for pioneering cultural change. In a bid to protect these unusual structures, part of the wider Maunsell Forts group that stretches along the English coast, and their role in 20th century security and social revolution, the Painted Oceans Project was conceived whereby a collection of notable street artists - in addition to Eaton - such as Shepard Fairey, How & Nosm, The London Police and Futura 2000 would adorn the forts with murals and protect their exterior with a new paint job. Not only that, but working with the Project Redsand Trust, each fort would be structurally restored and connected again by lightweight bridges, with a selected few then converted to museums dedicated to their unique heritage as symbols of resistance. Resistance is the operative word. Despite receiving approval for this novel conservation idea, from both the Project Redsand Trust and the English Heritage Foundation, and worldwide financial support through Kickstarter, Eaton’s plan has met with obstacles as large as the forts themselves. Based entirely on online research and without direct comment from any sources, it appears that the project has some detractors. Additionally, there also seems to be some parties with alternative plans for the forts. On Change.org, a man named Ian Hope has challenged the project with his petition to John Whittingdale MP, to stop the apparently disrespectful act of covering the forts in graffiti art. With 210 supporters of the petition, Kickstarter funding for the project has stalled and Mr. Hope is directing people to donate directly to Project Redsand – the Trust set up to manage restoration options for the forts. One of the other options the Trust might be considering, although it is not confirmed, is the proposal to convert the forts into very unique accommodation. Enter, David Marriot Cooper with his helipad and catamaran jetty idea, otherwise known as The Maunsell. According to press reports, Mr. Cooper happened to have a chance meeting in a pub with someone interested in preserving the forts, and the business consultant was asked to come up with an idea to do just that. Whether the individual/s who requested Mr.Cooper submit a proposal had any connection with the Redsand Trust or with the petition is unknown. So far, there does not appear to be any petition arguing that construction of a luxury destination in these historical buildings treads a fine line in retaining historical features. It could be surmised that a community initiative to raise money to protect ailing structures with commissioned urban art (as opposed to unsolicited graffiti), may not be as popular as a commercial project that may alter the integrity of the forts, and reserve access to them for those that can afford it. As we head towards the northern summer of 2016, the time scheduled for work to start on the Painted Oceans project, it remains unclear as to what will happen to the Red Sands Sea Forts. Mr Cooper updated in February 2016 that the hunt was on to find a developer for his project. Whether approved by authorities or not, the future of both The Maunsell and Painted Oceans rely on funding before they can proceed, be it from developers or by crowdsourcing. We can only assume that Project Redsand Trust would be party to deciding which proposal, if any, wins out. Meanwhile, street art continues to check the pulse of our societies and contribute to social commentary in powerful ways, and property developers continue to shape our urban environment by altering public structures. If one is defacement, then perhaps it could be argued that the other is too. 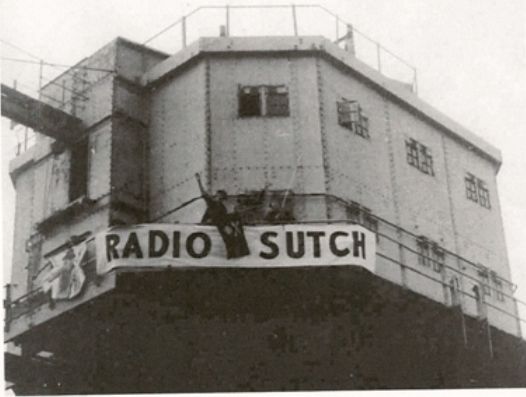 In this sea of change let’s hope the tide turns so we can all, like the pirate radio predecessors, resist the temptation to give in to the predilections of a few and think of the greater good. If you have any information that clarifies the facts in this article please contact us and we will provide an update.